In a clear plastic bag, pound the chicken breasts. If the chicken breasts are large cut in half. Season the chicken with 1/2 teaspoon salt, 1/2 teaspoon pepper and sprinkle the sage all over. Wrap each chicken piece in a slice of prosciutto. Spread the flour onto a plate and press the chicken onto the flour covering it entirely and dusting off excess. Transfer the chicken to another plate or dish. In a large skillet heat 2 tablespoons of the oil to medium-high. Add the chicken pieces and fry until golden brown about 5 minutes each side until just cooked through. Transfer the chicken onto a clean dish. To the same skillet add the riesling wine and chicken broth and boil over high heat until reduced by half, about 5 minutes. Whisk in the butter. Reduce heat to medium, add back the chicken and 2 tablespoons parsley and cook until hot, 2 minutes turning chicken once. Season with the remaining fresh parsley, then serve and pour the sauce on top. Thanks, I need to make this again. So good! 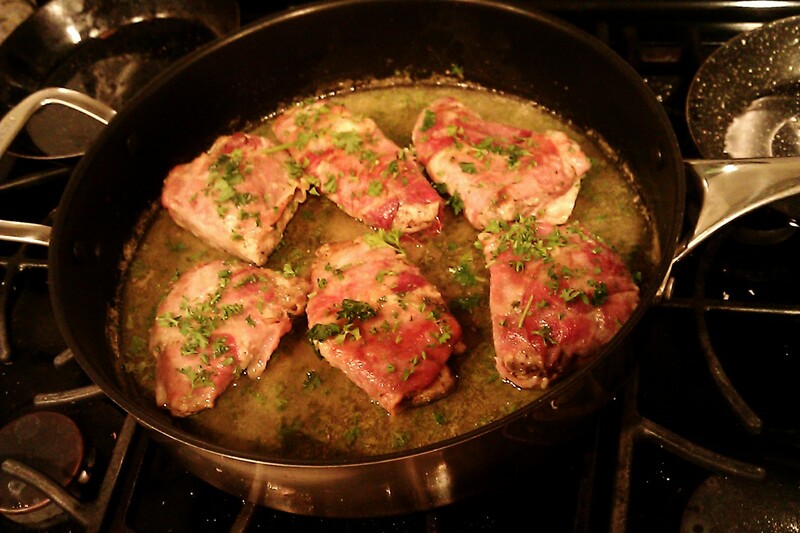 I haven’t made saltimbocca in ages. Thanks for the reminder & a great recipe. It’s been years since I have had this dish, great recipe, it looks so delicious. Thanks for reminding me how much I love this dish. You’re welcome. And kudos for making chocolate chip cookies for the workers – that’s so generous and kind. I was hoping to see a pic of them enjoying your cookies … but I’m sure they did. This sounds incredibly tasty! I’m always looking for new chicken recipes. You really can’t have enough. Thank you, Megan. We also had a November wedding ten years and counting. Congratulations on your new marriage!